Description: OpenSS7 SIGTRAN Stack Overview. The IP SS7 stack has been a focus of OpenSS7 for some time as well. The SIGTRAN stack components provide the basis for redundancy and distribution in OpenSS7 and provide the principle glue between the SS7 protocol levels in a redundant and distributed system. IP SS7 stack components include IPSS7, M2PA, M2UA, M3UA, SUA, TUA and TALI. Additional components not standardized by the IETF include ISUA and BUA. The UA Layer Manager product provides configuration and management tools for the OpenSS7 SIGTRAN stack. 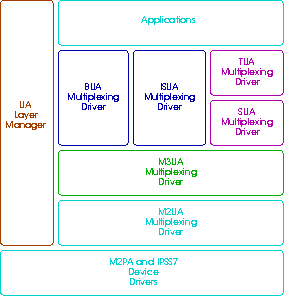 The BUA product provides a Bearer Independent Call Control (BICC) User Adaptation Layer (BUA) STREAMS multiplexing driver which will provide the BUA protocol modules. The ISUA product provides an Integrated Services Digital Network (ISDN) User Part (ISUP) User Adaptation Layer (ISUA) STREAMS multiplexing drvier which will provide the ISUA protocol modules. The TUA product provides a Transaction Capabilities Application Part (TCAP) User Adaptation Layer (TUA) STREAMS multiplexing driver which will provide the TUA protocol modules. The SUA product provides a Signalling Connection Control Part (SCCP) User Adaptation Layer (SUA) STREAMS multiplexing driver which will provide the SUA protocol modules. The M3UA product provides a Message Transfer Part (MTP) Level 3 User Adaptation Layer (M3UA) STREAMS multiplexing driver which will provide the M3UA protocol modules. The M2UA product provides a Message Transfer Part (MTP) Level 2 User Adaptation Layer (M2UA) STREAMS multiplexing driver which will provide M2UA protocol modules. Copyright © 2014 OpenSS7 Corporation All Rights Reserved.